Henri Meschonnic wanted “to translate not what words say, but what they do.” At times wonderfully, at times unbearably irascible, but always controversial and “incontournable” (unavoidable), Meschonnic — poet, linguist, translator and theoretician — passed away a week ago at the age of 77. His output was immense — close to sixty books — though what he will be remembered for best are most likely his translations from the Old Testament published in Les Cinq Rouleaux, Le Chant des chants, Ruth, Comme ou les Lamentations, Paroles du sage, Esther and what is probably his most famous theoretical book, the 710-page Critique du rhythme (recently reissued in paperback by Verdier). His poetry I find of much less interest (example: “I advance with / the silence of the trees / I walk with / the circle of the sky / I do not speak / my words / I walk them / and I walk my silence / it does not begin / and it does not end”) and I positively detest that range of his essayistic work in which he viciously denies any merit to the work of poets such as Yves Bonnefoy, Michel Deguy, Jacques Roubaud and Christian Prigent whom he all condemns as impostors and ignoramuses without in the least addressing their work as such. He is little known in the Anglo world and nearly none of the work is available in translation. A few years back the English poet & editor Piers Hugill started an ambitious blog that was to bring Meschonnic’s work to the attention of English-speakers, but it seems to have petered out rather rapidly. 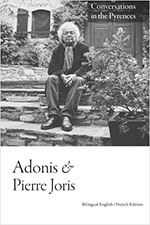 Still, that white-maned whirlwind of a man, who’d pop up (un)expectedly anywhere where talk of poetry & translation was on the air, will remain a core figure of the French literary scene of the last half-century. I’ll reread a chapter or two of his Critique of Rhythm in memoriam. Yes, various ‘events’ conspired to make this work impossible at the time, but I am beginning to start on this again with Emmanuel Fruteau with whom I hope to begin the work of translation and ‘reception’ once again. I will of course advertise the blog again once there is more content on it. What a poor absence of real commentary I just read above. Reread is nonsense when one can’ t read for a start. The established poets prevent themselves from any criticicism. They only accept critcisms in beetween in other. All that doesn’t confirm them is dismissed. Do any of you have a link to an obituary for Henri? No, not offhand. but you could certainly try googling some. Or check French papers such as le Monde or Libération. 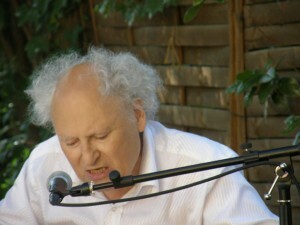 Concernant le passage qui se réfère à Célébration de la poésie sans le citer (“I positively detest that range of his essayistic work in which he viciously denies any merit to the work of poets such as Yves Bonnefoy, Michel Deguy, Jacques Roubaud and Christian Prigent whom he all condemns as impostors and ignoramuses without in the least addressing their work as such.”), je voudrais apporter ma propre perception de lecteur. Il est de bon ton en France de comdamner cet aspect critique de l’œuvre de Meschonnic et de le renvoyer à la posture du misanthrope de Molière, au nom du bon ton, d’une soi-disant éthique universitaire, etc. Pour ma part, je ne crois pas que Meschonnic dénie toute valeur aux œuvres de Bonnefoy, Deguy, et alii. Je ne crois pas non plus qu’il le fasse sans argumenter: ses critiques à l’égard des œuvres en question sont simplement formulées ailleurs, dans d’autres ouvrages. En fait, l’objet du livre de Meschonnic est de dénoncer une posture de mythification de la poésie, sur laquelle certains des poètes évoqués capitalisent du pouvoir institutionnel et de l’autorité intellectuelle. Voilà ce que m’inspire votre propos.